Here are a few online resources and tips for choosing a bond broker or agent, so that with the tap of some keys and the click of a mouse, you can access the most modern methods — the most efficient, friendly, and profitable methods — for buying and selling individual bonds. Do you need a broker or agent at all? You don’t need a broker or agent to buy Treasury bonds. You can do so easily and without any markup on Treasury Direct. Municipal bonds and corporate bonds must be purchased through an intermediary; you can’t buy these securities directly from the issuers. Sure, you can loan your neighbor or brother-in-law $1,000 and demand the money back with interest, and that’s a bond, of sorts. But if you want to buy and sell marketable fixed-income securities, you must go through a recognized agent. Going through a financial supermarket, such as Fidelity, T. Rowe Price, or Vanguard, is (generally) cheaper than going through a full-service, markup kind of broker. The supermarket’s pricing, which is a concession or a fee (more or less), not a markup, is perhaps more clear-cut. But the supermarket agents generally hold your hand only so much, and they won’t make actual bond selections for you the way a full-service broker will. Find someone who truly specializes in bonds — preferably the kind you’re looking to buy. If you needed hand surgery, you wouldn’t go to a gastroenterologist, would you? If your dealing in individual bonds is going to be any more profitable than, say, investing in a bond index fund, you need a broker or agent who truly knows and tracks the markets carefully — someone who can jump on a good deal. Start by asking people you know and respect for referrals. Make calls. Ask lots of questions about a broker’s background, including academic and professional history. Ask for client recommendations. Don’t be shy. Ask for numbers: What kind of return figures has this broker been able to garner for clients, and taking what kinds of risks? Be on guard. Always. Whenever you find a broker and agree to buy or sell individual bonds, be certain that you aren’t paying an excessive markup. Although different people in the investment business have different concepts of what constitutes “excessive,” if you’re asked to cough up the equivalent of more than three months’ interest, that’s excessive. Know a dealer’s limitations. Most bond dealers are not the best people to build your entire portfolio. They often have limited knowledge of investments beyond bonds. (And that’s probably a good thing; see the first bullet in this list.) If they deal in stocks at all, they often deal in pricy stock mutual funds that you don’t want — the kinds that earn them a nice commission. If you deal with a full-service broker, you won’t have to know every detail about trading bonds online. But still, at a minimum, become familiar with the website of the Securities Industry and Financial Markets Association and the website of the Financial Industry Regulatory Authority. 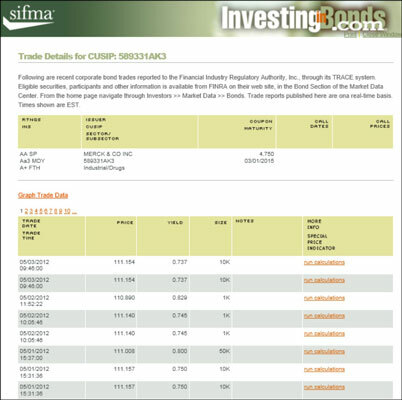 On these websites, you can plug in information on any bond — either by the name of the issuer or the bond’s CUSIP — and you’ll experience the type of transparency that makes trading easier. If a bond has recently been sold, these websites can provide you with lots of information: the bond’s selling price; how it’s been rated by Moody’s, S&P, and Fitch; and its coupon rate, price, and current yield. 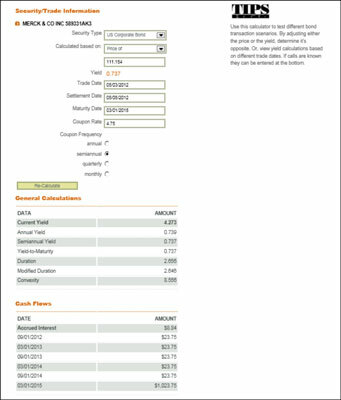 The site InvestingInBonds.com features a nifty bond calculator you can use to plug in the price the bond dealer is offering you (which includes his markup) and see if the yield still makes sense given your objectives and the yields of similar bonds. This figure shows the recent trading history of an everyday bond (from the pharmaceutical company, Merck) as seen at InvestingInBonds.com. You can see the price paid for this bond and the resulting yield. This gives you a pretty good idea of what you should be getting, should you wish to buy or sell . . . provided the particular bond you’re interested in has seen recent action. If you click on Run Calculations, you get something that looks like this. To get a bird’s-eye view of the bond market, go to Yahoo! Finance. The chart you find there gives you a pretty good idea of what various categories of bonds are paying on any particular day. If you’re in the market for a bond, compare the composite yield to the yield you’re being offered. If you aren’t being offered at least as much as the average yield, ask why. The Yesterday, Last Week, and Last Month columns show you which way bond yields are headed. But remember that yield trends, just like the wins and losses of your favorite sports team, can reverse direction quickly.